The Mortal Instruments: City of Bones, tells of a story about a young girl named Clary Fray who embarks on her summer in NYC, living in Brooklyn, and ends up with a life that is far from what she calls "normal". Along the way with her best friend Simon, her mother Jocyln, and an old family friend named Luke, they meet some interesting people. Some of these people include Jace, Isabelle, Alec, and Hodge. 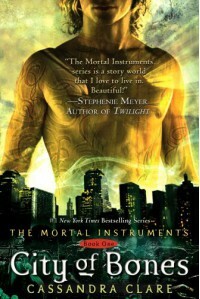 Things get complicated when Clary finds out about the world of the Shadowhunters and their ways of living. The end result is an epic journey into the unknown and the ability to not only trust herself, but that of others as she beings self rediscover of her past that makes her finally feel like she belongs in the sea of 1.8 billon people. I'm not sure who has read the book, but I'll try to keep spoilers to a minimum. My only issue with the story was how the characters Clary and Jace turned out in the end. It felt like a true greek tragedy to the point of how they found out a missing link between them: Valentine. That in itself kind of rubbed me wrong on a few levels, I mean if they were "cousins" then thats a different story and I would have been chill with... but they are not. Kind of takes it to a whole new ice factor level. Anyway, the story itself was great! I loved how there was a whole back history to so many well known mythology of werewolves, faeries, vampires, warlocks, and more! It made you feel as though you had another piece to the puzzle of this story come alive. I did enjoy the descriptions of the landscape, because of my own adventures in Manhattan over the years. I could picture the driving along the hudson river past the building on the west side, the imagery of the village with the cobble stone on the ground, the grand cathedrals standing tall in downtown, and the way it was when you get to the subways. Everything was perfectly described and I have to thank Cassandra for adding that amazing touch to the story! I do however found it to be slow twice in the book, but that's because sometimes a first novel has that happen. The need to get out certain details and making the reader understand the world that which these characters come from too. Lastly, I feel like there was something missing in regards to some more backstory about the characters. I can't put my finger on it, but something felt left out. I'm hoping it's in the sequel because it's the reason I couldn't give it 5 stars and the way things played out with Clary and Jace too is the other.